Since 2014 June, we see Yangzijiang recovering slowly (from the chart above) in a parallel channel, currently it is also trading near the 52week high, we like to look out for stock that is trading at the 52week high as history has thought us, stocks that break 52week high have a higher chance to move up further because there is less resistance ahead. 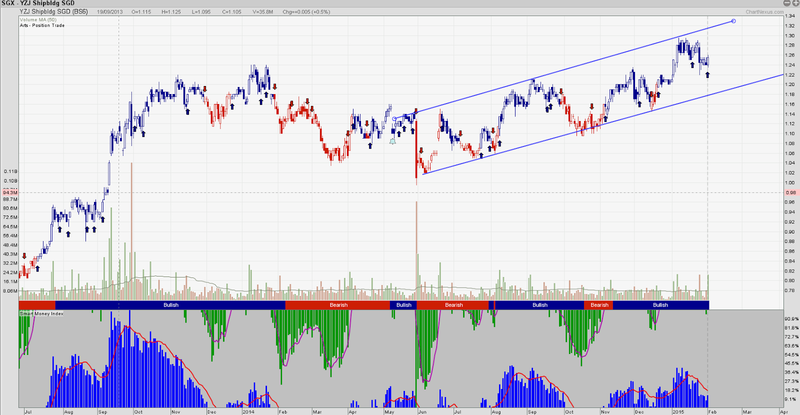 Currently the support of YZJ is at 1.20, trend remain bullish if price stay above this level for the mid term period. Yangzijiang (YZJ) gained approximately 7% since the beginning of 2015 amid a volatile market, outperforming the STI’s 0.6% decline. The stock closed at $1.29 yesterday, its highest closing price in over two years. Macquarie Equities Research (MER) issued a report on YZJ on 9 January, raising their 12-month price target to $1.55 based on a Relative Net Asset Value methodology with an Outperform call on the ship builder. Here are some excerpts from the report. YZJ was a surprise outperformer in the Singapore industrials sector in 2014 (up 2% versus peers down 20-30% each) on the back of strong order inflows and better-than-expected margin performance. MER expects the trend to continue into 2015 and keep YZJ as an Outperform with a slightly increased target price of S$1.55, up from S$1.45. Orders: New high value orders for 4x260,000 deadweight tonnage (dwt) bulk carriers and 6x10,000 Twenty-foot Equivalent Unit (TEU) containerships allude to the inroads YZJ is making into the very large bulk and container segment. Margins: Gross margins were better-than-expected on the back of pre-2008 vessel order deliveries. MER now expects Full Year 2014 gross margins to be in the region of approximately 26% vs a previously expected ~23%. With 13 new orders for very large vessel types, YZJ is fast becoming a serious player in a segment previously dominated by Korean yards. Yards will be highly utilized up till 2016. These options comprises 2 x 36,500 dwt bulk carriers, 2 x 10,000 TEU and 2 x 2,700 TEU containerships and estimated to be about US$300m. - MER estimates US$1.6bn of new orders in 2015: YZJ will continue making inroads into the very large vessel segment, in MER’s view. MER estimates 28 bulk carriers and 5 containership orders in 2015. - Margins will come down a bit but could surprise on the upside: MER expects margins to fall as lower value post 2008 contract options were exercised but higher value contracts may mitigate this. MER is estimating 23.2% Earnings Before Interest Tax Depreciation and Amortization (EBITDA) margin in 2015 and 22.7% in 2016 which have upside risk. MER is increasing their earnings estimates by 26% and 19% for 2015 and 2016 respectively as the 2014 order inflow number and margins were much above their estimate. Increasing target price from S$1.45 to S$1.55. Recovery in shipbuilding prices and continued strength in management execution to drive the stock in 2015: YZJ’s dependence on offshore rigs orders is declining which works to its favour given the current oil climate. MER thinks YZJ could beat consensus with better than expected shipbuilding orders at higher prices. At 8x 2015E Price / Earnings and 1.0x 2015E Price / Book with 13-14% Return On Equity, the stock looks attractively priced in MER’s view.